It’s been a slow wine week here due to various plans and sports but we managed to squeeze in this great little bottle of Crozes-Hermitage with some excellent lamb chops. We’ve yet to review a wine from this AOC but there’s good value to be found here. Most of the wine made is red and is 100% Syrah with a small amount of white also being made. Crozes-Hermitage is the biggest region in Northern Rhone however the wines are generally not regarded as highly as it’s neighbors: Cote-Rotie and Hermitage. The reds from Crozes-Hermitage are often thought of as good wines to drink while the bigger reds of the neighboring regions mature and drink well young. colonelgrape: 87: Nice complexity for a young Syrah but not overpowering. Black fruit, graphite, licorice on the palate with some tartness and tannins but they had settled down and structured the fruit nicely. A really nice medium-bodied, young wine that is drinking well after only 3 years. The alcohol content wasn’t through the roof either like some of the California Syrahs which made this bottle much more drinkable with dinner for two. 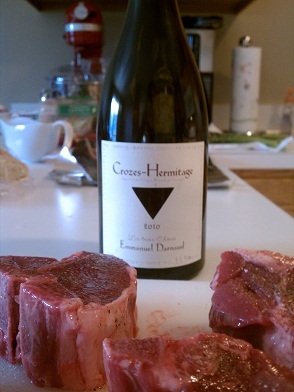 It also was only $30 and a great value for French Syrah. Drink it with a nice cut of red meat and you won’t be disappointed. MobyGrape: 83. I’m digging on Syrah these days, I’m going to have to get the Colonel to pick up some Syrahs from around the world to see what else this little guy can do. Had some definite tannins to even out the spicy fruit, so it worked well after decanting for a bit and with salami and cheese before dinner. This entry was posted in Crozes-Hermitage, France, Rhone, Syrah on May 16, 2013 by colonelgrape.